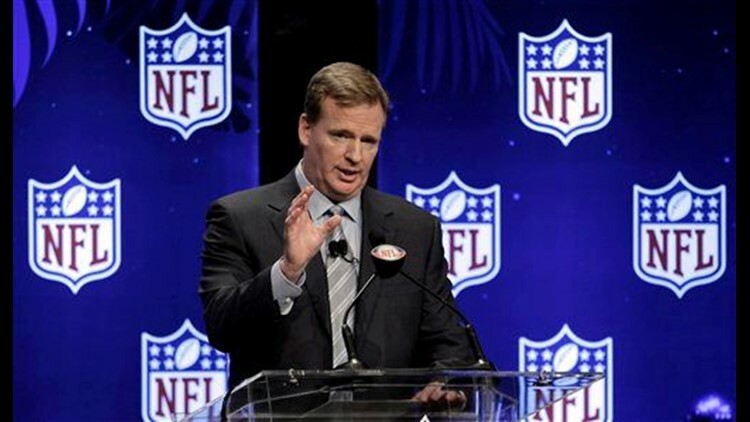 ORLANDO, Fla. (AP) — The NFL changed its overtime rules for playoff games. Starting next season, if a team wins the coin toss and then kicks a field goal, the other team gets the ball. If the game becomes tied again after that next series, play will continue under the current sudden-death rules. If the team winning the toss immediately scores a touchdown, the game is over. Team owners voted 28-4 on Tuesday in favor of the proposal at the NFL meetings. Minnesota, Buffalo, Cincinnati and Baltimore opposed the change. Minnesota lost last season's NFL championship game in overtime to New Orleans. The Saints won the toss, drove downfield and kicked a field goal to win. "Modified sudden death is an opportunity to make a pretty good rule ... even better," said Atlanta Falcons president Rich McKay, co-chairman of the competition committee. "Statistically, it needed to change. It wasn't producing the 'fairest result.'" Those statistics showed that since 1994, the team that won the overtime coin toss won the game 34 percent of the time on the first possession. Overall, the team that correctly called the coin toss won overtime games 60 percent of the time in the last 15 years, or since kickoffs were moved back 5 yards to the 30. "Plenty of people on the committee, myself included, are so-called traditionalists," Indianapolis Colts president Bill Polian said. "I am proud to be one. But once you saw the statistics, it became obvious we had to do something." The new rule applies only for postseason games. But McKay said even that could change, and several owners expressed interest in further discussions at their May meetings in Dallas. "There was a lot of sentiment in the room to change this rule for the regular season," McKay said, adding he doesn't expect that to happen this year. "Our thought is to take our time and study it a bit and make sure everyone understands the implications there would be for that." McKay and Polian said the Vikings-Saints game had little role in passage of the rule change. "That's interesting," McKay said. "One of the teams that voted against was in the game and, last I checked, I don't think they won." Vikings owner Zygi Wilf said Monday he was inclined to vote no. "You need consistency of the regular season and the postseason," Wilf said. During the season, games end in ties after a 15-minute OT. In the playoffs, a winner must be determined. McKay and Tennessee Titans coach Jeff Fisher, the other competition committee co-chairman, said coaches quickly began favoring the change once they learned the details. It became such a hot issue that the owners' vote was taken one day earlier than expected. One of those coaches, Marvin Lewis of the Bengals, is on the committee. Hours before his team voted no, Lewis expressed approval of the alteration. "There's a lot of elements that come into play," Lewis said. "For all the proposals we've discussed, this is I think the most complete one." McKay said it was critical in making the rule change that "no phase of the game" was "adversely affected." The players' union has said it believes any change in overtime needs to be collectively bargained. Of course, the contract between the league and players expires next March. While the competition committee briefly discussed potential OT changes with the union in February, the NFLPA was not consulted this week. Denver Broncos receiver Brandon Stokley doesn't like the rule change. "I just think that they should keep it like it is," he said. "It makes things interesting. Some people don't like the coin toss, but that's just the way it goes. If you're on defense first and you don't have the ball, you've just got to stop them." AP Sports Writer Arnie Stapleton in Denver contributed to this story.